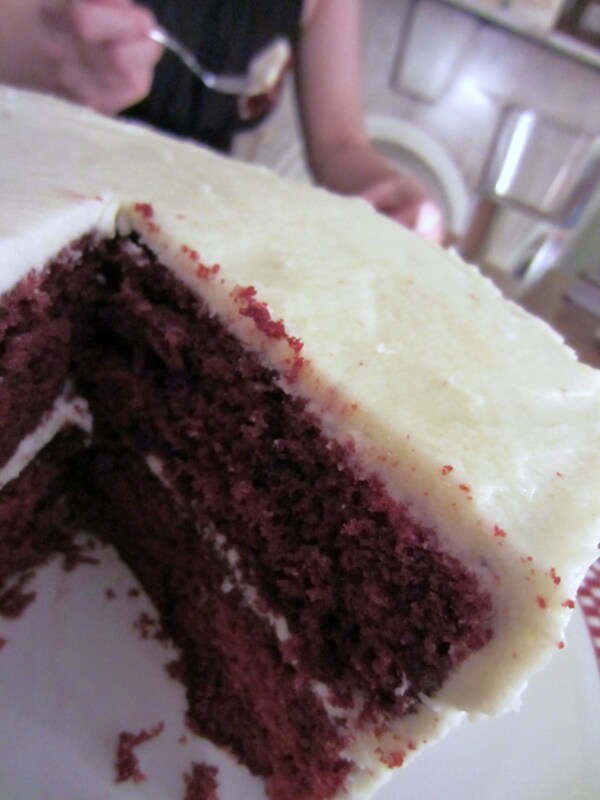 An old-fashioned Red Velvet with a cooked frosting that mimics whipped cream, in place of cream-cheese frosting. Preheat oven to 350 degrees. Butter and flour two, eight-inch round cake pans. In large mixing bowl, cream butter, sugar and eggs. In a small bowl, make a paste of the food coloring and cocoa. Add to creamed mixture and blend well. In separate bowl, mix together flour and salt. Add to creamed mixture, alternating with buttermilk. Add vanilla. In a small bowl, add baking soda to vinegar. Blend into the batter. Pour batter into cake pans and bake for 25-30 minutes. Cool completely in pans. In large bowl, cream sugar, vanilla and butter. Add cooked milk-flour mixture. Beat on high speed, until very fluffy. Frosting will resemble whipped cream.